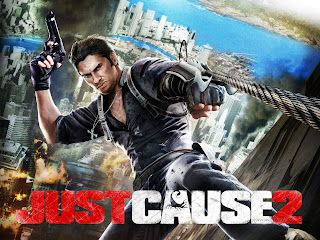 ﻿﻿Just Cause 2 is an amazing piece of art, most likely inspired by drugs and spiderman fans. In this game, you play as a fearless agent of some questionable federal agency. You are sent to the tropical island of Panau, a military based island, to find out if one of your agents that had vanished off the radar a couple weeks back had become rogue. In the process, you soon learn in order to do so you must team up with the 3 local gangs, the Roaches, Ular Boys and the Reapers. The main character that resembles spider man (his logo is a scorpion, not a spider) is named "Scorpio." Throughout the game, you complete a series of side-quests in the order of your choice, and each completed quest unlocks more, until you've caused so much chaos you unlock an "Agency Mission," which are the quests that make up the main plot of the game. The people in this game are generally split into 3 categories. The innocent civilians, the police, and the main characters. The civillians are all unimportant background characters that don't do anything but yell at you when you run them over. They are all oriental, and can't seem to interact in any way other than fear. Main characters are the only people in the game with any personality at all. However, you only see them in cut scenes, making this game really just you and random bots. The police are all trigger happy men in red vests that tend to shoot you regardless what you do. In fact, on more than one occasion I've been shot at just for walking near a cop, or doing something just as harmless. On the positive side, what really makes this game fun and worth playing are 2 things: your ability to infinitely poop out parachutes, and your grappling hook, which allows you to be some kind of futuristic spider man. Your parachutes are huge grey cloths that would come out of your parachute harness, except your not wearing one. In fact, the only thing on your back is your primary weapon, leading many to question if your character is a magician of some sort. Your grappling hook however is not magic. It's just a 200 meter long tow rope that can be concealed in a watch sized bracelet, and has the ability to pull you at speeds greater then any vehicle in the game. Nothing odd about that. Its like spider man, with guns and parachutes. How awesome is that?! Besides those abilities your player, when given the opportunity, can leap about 20 meters onto the roof of a vehicle, because once your on the roof, you can pull out the poor guy driving it and escape with their ride. Or circle back to run him over. Also impressive is your ability to latch onto anything in the game with your grappling hook, quite literally as the game never limits your ability to hook onto solid objects. Graphics wise, this game is quite amazing to play, or watch. The explosions are crisp looking (not sounding) and lighting is done much more impressively then games of a similar genre such as Grand Theft Auto. I can even honestly say sunsets and sunrises look so much better in the game then our smoggy reality. But, as with all games there are some drawbacks. There are only about two types of police officers. The game gets pretty repetitive when you only kill two types of people. Variety is certainly an issue, because Avalanche only gives you a total of about five types of primary and secondary weapons. Also, the scenery may be beautiful at first, but since everything is either snowy as Canada, desert-like, or very tropical, you grow bored of it. The first 50 hours of this game are great, full of adventure and mystery, but after that it becomes repetitive and you will definitely lose the feeling of "What will happen if I..." because everything is predictable. The police only have like 2 moves anyways: chase your vehicle until they accidentally drive off a cliff, or blindly fire at you, murdering civilians in the process. Spider man / 2 + [Grand Theft Auto ^ Better Graphics] - Physics = Just Cause 2. If we were to ask Avalanche Studios why they would make a game like this, their answer would probably be: "Just Cause...2."